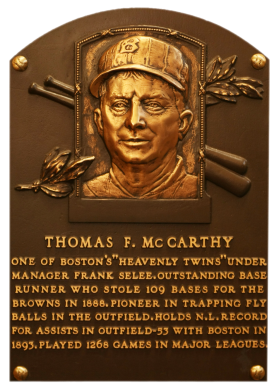 Tommy McCarthy made a lasting make on the game when he perfected the fly-ball trap in order to throw out the lead runner of a double play, leading to the infield fly rule. Although he was best known for his defense, in 1893 he hit a robust .361, helping Boston to the NL title. He was a .292 hitter and topped the .300 mark four times. Comments: I've searched and searched but there' no issue contemporary to McCarthy's career showing just his face. The 1895 N300 comes the closest with a photograph from the waste up and Tommy looking off into the distance. 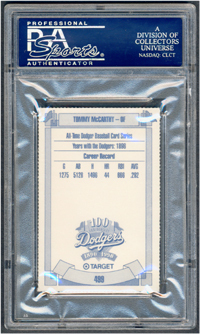 But, there is this 1990 Target Dodgers card. I first found it on eBay and picked up a copy for $4 inc. S&H from Perry Eaves (dealer with lots of neat tribute cards) in October, 2002. It was submitted to PSA and graded NM-MT in January, 2003. 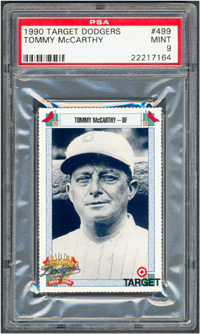 In October, 2004 I picked up a complete set of uncut sheets for $19 inc. S&H with the hopes of hand cutting the McCarthy to get a MINT/GEM MT grade from PSA. Unfortunately, I cut the card to short both ways and PSA wouldn't grade it; deemed the card trimmed (ha, ha - you think). I picked up another set in May, 2011 for $18.50 inc. S&H but have yet to attempt to nicely "rip" the McCarthy out. I'm assuming the proper way is bending at the perforations and tearing; rather than using scissors. So far this guy has cost me $50! I don't think I'd get a dollar if I tried to sell it on eBay. UPDATE: I was able to pick up a couple beautiful examples of this card from Burbank Sportscards in late 2013. I was positive one of them would grade out GEM MT as they were centered perfectly. Well, that didn't happen - both graded out MINT 9 when I got them back in January, 2014. But, I was still pretty happy with the upgrade.